If you’re not already getting this free resource-focused e-letter, click here to subscribe. Nearly three years ago, I started replacing all of our incandescent and fluorescent bulbs with LED versions. I decided recently to compare the last 12 months of electric use with our use before the switch. I was shocked. We are now saving $840 a year. This is real savings any homeowner or investor can appreciate. If you want to start the LED switch, first go after the low-hanging fruit. High-use areas like kitchens, family rooms and children’s bedrooms are top of the list. Few kids care about energy efficiency. They leave their lights on most of the time whether they are in their rooms or not. I want to talk about the growing marijuana industry. The Fastest-Growing Industry in the U.S.
As I write, more than half the states have passed some form of marijuana legalization. And that means marijuana production is on the rise. In 2016, North American sales grew 30% to $6.7 billion. They are projected to exceed $20.2 billion by 2021. Growing all that pot consumes huge amounts of energy. Much of it goes toward lighting. In 2012, the Lawrence Berkeley National Laboratory conducted a study on pot-growing energy use. It concluded that as much as 1% of U.S. electricity was then used for growing pot. At the time, that was equal to about $6 billion. Three years ago, the Northwest Power and Conservation Council estimated Washington state pot operations could increase electric demand by 60 to 160 megawatts over the next 20 years. Regional demand, which included Washington and a few surrounding states (Oregon, Idaho and Montana), could hit 240 MW by 2035. That’s a lot of power going to pot. The amount of power required to grow four pot plants is identical to the amount used by 29 refrigerators during the same time frame. Electricity accounts for about 14% of expenses for growers who use traditional sodium vapor lighting. The problem with sodium vapor lights is they generate a tremendous amount of heat and therefore aren’t very efficient. Switching to LED lighting cuts power use in half. But electric savings are even greater, since cooling bills are much lower with LED lighting. LEDs generate almost no heat. Because California, the world’s sixth-largest economy, recently legalized marijuana for recreational use. And California’s efficiency standards have a habit of driving their way into the rest of the country. Most commercial growers raise their pot plants indoors, even though raising them outdoors takes energy costs close to zero. Of course, pot is no ordinary crop. Security is a major concern. Theft is a very real possibility. A few months ago, our nightly news showed a midnight raid by thieves on a legal outdoor grower out West. He lost dozens of plants worth thousands of dollars. Outdoor growers have to spend tens of thousands of dollars on security cameras and guards to monitor them. But growing indoors means plants are secure. It also means everything else associated with growing pot can be controlled. I’m talking about air temperature, moisture requirements and, most of all, the amount of sunlight plants get. In the beginning, grow lights must be on for longer periods of time to accelerate plant growth. When plants reach maturity, switching to a 12-hour day stimulates bud growth, which is what growers are after. So lighting ends up being an important aspect of successfully growing pot. Commercial growers have facilities that vary in size. The larger ones approach 100,000 square feet, the size of big-box retailers. Energy use for big commercial operations can hit $50,000 to $100,000 per month. Saving 20% to 30% of that by using LED lighting is something growers readily embrace. Right now, investors wishing to cash in on LED lighting for greenhouse applications have few choices. Koninklijke Philips NV (NYSE: PHG) offers LED greenhouse lighting, but it’s a small percentage of this international conglomerate’s revenue. Cree Inc. (Nasdaq: CREE), a pure LED lighting play, offers LED greenhouse lamps. 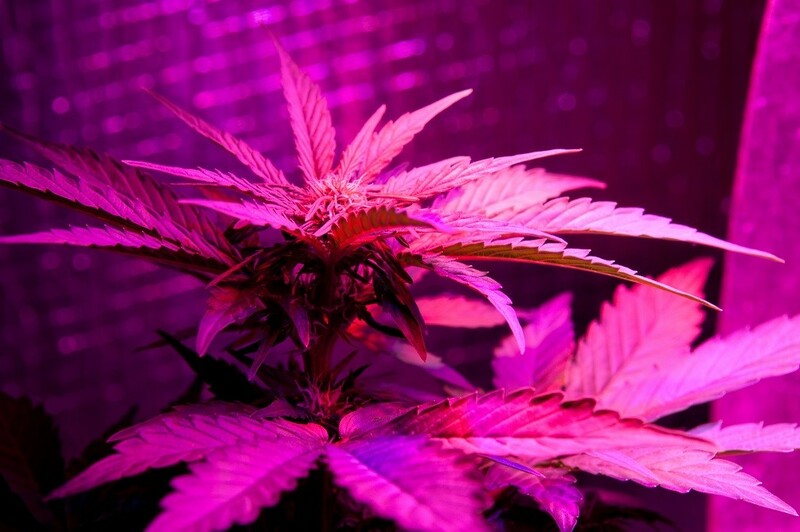 LED grow lamps are an interesting pick-and-shovel play on the exploding marijuana industry. I’ll be following this closely in the months ahead. P.S. My colleague Matthew Carr is high on the pot industry. (Just kidding... kind of.) He was once skeptical of marijuana investment opportunities, but recent legislation has changed his mind. To check out Matthew’s latest research on the explosive growth potential of this industry, click here. Matthew Carr’s Prime System Trader service exploits predictable trends and cycles in stock prices. 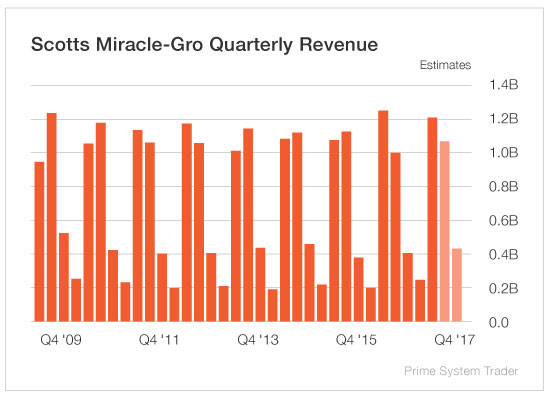 It’s no surprise that he has recently recommended a popular indirect play on marijuana farms - Scotts Miracle-Gro (NYSE: SMG). The company’s famously high-quality fertilizers have lots of fans among marijuana growers and casual gardeners. I live in an area where “a fox in the henhouse” is a real thing. The first quarter is the company’s slowest. But the second and third quarters vie for the busiest. And then there’s a step back down in the fourth quarter. For Scotts, the planting season is extremely important. And the month of May alone accounts for 25% of all soil sales the company will see each year. As I mentioned, May is an important month for Scotts in terms of sales. But May is the worst month of the year for the company’s shares. Since 2004, shares of Scotts have ended the month of May higher just four times. This May, shares tumbled 10.5%, marking the fifth time in six years shares have declined in the month. But we see that July through December are surprisingly strong, with August and October showing big jumps higher. In August, Scotts releases third quarter earnings, one of its best-received reports of the year. During the past five years, shares have averaged a one-day pop of 2.8% and have risen every time. Plus, shares of Scotts have ended August lower only twice since 2004.